Say goodbye to the effects of sun damage, rosacea, hyperpigmentation, and more. With the innovative Intense Pulsed Light (IPL™) photofacial procedure, gentle skin rejuvenation is now easier than ever. IPL™ photo rejuvenation is the latest in modern dermatology, allowing patients to transform red, blotchy skin into a radiant complexion. If you suffer from any of these problems, photofacial treatments may be the dermatological approach you’ve been looking for. A photofacial is a procedure in which intense pulses of light are used to penetrate deep into the skin. IPL™ photo rejuvenation then causes collagen and blood vessels below the epidermis to constrict, reducing redness and age lines. The procedure involves only minimal discomfort, while the redness and swelling that sometimes occur after treatment disappear shortly. Most benefits of a photofacial occur gradually in the weeks following treatment. People who have blotchy, sun-damaged, or discolored skin, or whose skin is affected by large pores, freckles, or wrinkles, may benefit from an IPLTM photofacial. The procedure is also quick and involves no downtime, making it a convenient option for people with busy schedules. Those with dark or deeply tanned skin sometimes experience complications following IPLTM photofacial treatment. Patients should discuss such issues with a trained dermatologist before undergoing treatment. The IPLTM photofacial is an effective way to minimize the aesthetic impact of enlarged pores, light wrinkles, and moderate sun damage. Because it is non-invasive, it allows doctors to make cosmetic improvements quickly, conveniently, and with very little risk or discomfort. 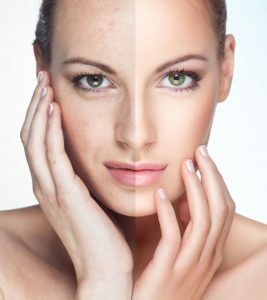 Laser skin resurfacing, on the other hand, is used to deal with more serious skin problems, such as deep wrinkles, serious sun damage, and severe acne scarring. In evaluating the benefits of an IPLTM photofacial vs. laser skin resurfacing, there are a few differences patients should be aware of.